1. Here is what the strobe looks like, shot taken on Seven Seas live-aboard, see Photo 1. 2. Quick analysis of performance (based on that one dive only): Very accurate TTL performance, once the strobe is fully recycled. Harald Hordosch of Seacam wrote to advise me that the normal expectation is 2 - 2.5 seconds after even a full dump. File number reflects the F-stop used, in half-stop increments from F-8 through F-32. Same distance & same shutter speed (1/250th), only change is aperture and all shot with strobe on TTL and camera on manual. Only reason I chose 1/250th was to eliminate any exposure variability from ambient light. Obviously, it will work at any synch speed, from the fastest allowable per camera to any slower shutter speed. Any one of the exposures would be fine, especially when processed from RAW. This is over a five stop range! Pretty amazing really, especially when you consider these are thumbnails from the RAW, screengrabs from Photo Mechanic with absolutely no levels adjustments. See photo 2. 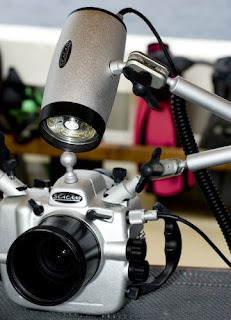 Note - Since I first posted this morning I heard from the electronics guru that designs the Seacam strobe and they prefer a slower shutter speed be used. 1/250th can of course work, but more consistent TTL is apparently achieved with a slower shutter speed. BTW ... when shot on manual power settings, like you might with wide angle, the recycle is quick and dependent on strobe power setting (as you would expect). As reference, this topside series shot on the camera table is what it looks like shooting normal brackets on manual. See photo 3. I haven't been such a strong proponent of TTL with digital over the years, but once I tried this strobe and had it in the back of my mind that I could pretty well figure on getting an accurate exposure the first time, I began to notice all the skittish critters I missed while shooting manual exposures in Raja Ampat because I never got a second shot. They bolted and I did not have time to adjust my aperture or strobe power setting. Something obviously to be said for strobe exposure automation, when it works properly, as this appears to. I'm sure most reading realize I am a Seacam distributor, but I am happy to report on the technology advances of any manufacture. Please consider this a simple head's-up on a functional new tool. The small pictures you show from the digital 150, what are the aperture settings? I can see a small kind of different colors. Frank - The tests start at F-2.8 and run through to F-32. I think the color differences are primarily ambient light striking the subject at the widest apertures. When you get up to around F-8, and ambient light stops affecting exposure, color temperature remains constant. If I'd done the test at night, the colors would likely be constant throughout the range.